When interacting with Enfocus Support, the support engineer who is handling your case may ask you to set up a connection to your computer. By connecting to your computer directly, our support engineers will be able to identify problems more easily, to install fixes for you, and perform other support tasks. 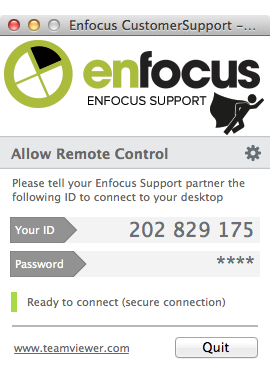 To enable this remote support, Enfocus uses a tool called Enfocus QuickSupport. It's light-weight, secure and does not require any software to be installed on your computer. How to use Enfocus QuickSupport? Run the Enfocus QuickSupport application. Mac OS X Mojave users, please read this article first! Take a note of the ID that is displayed and give them to your Enfocus support engineer. You don't need to worry about the password. Leave the Enfocus QuickSupport application open while our support engineers help you out.